Results are provided for a study of the properties of SiC refined by different methods (milling and disintegration) on morphology of the particles obtained. 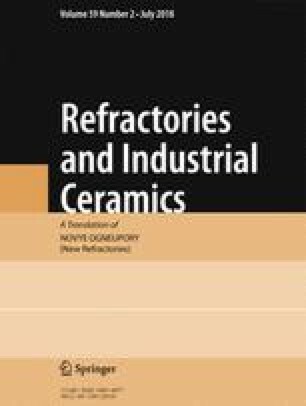 It is established that SiC refinement by disintegration in an amount of 10 – 20% within the composition of heat-resistant concrete compared with a similar amount of milled SiC improves concrete mechanical properties after hardening and firing from 11 to 23%, reduces its shrinkage by up to 25%, and improves thermal shock resistance by up to 20%. Translated from Novye Ogneupory, No. 3, pp. 50 – 56, March, 2018.